Death notice from The Charlotte Journal, 29 Apr 1836, p. 3. Genealogists have learned many early ancestors used the same personal names over and over again. The same name might appear in each generation of a family, sometimes without any middle names or convenient designations like "Senior" and "Junior." When "Senior" and "Junior" were used, it might be to differentiate between an older and a younger person who had the same name (women as well as men) but who were not necessarily parent and child; in fact, they may not have been related at all! Even when parents gave each child two personal names, it was not unusual for the children to have one name in common. Cabarrus Germans frequently gave the same first name to several sons who went by their different middle names, like Johann George, Johann Michael, and Johann Henrich. Precisely because these situations exist, genealogists quickly learn, as a way to organize individuals, to add birth and death dates whenever possible. Even that does not always work. Cemetery. Courtesy of Linda Flanagan, www.findagrave.com . Take the case of George Miller who died in Cabarrus County in 1836 and George Miller who died in Cabarrus County in . . . 1836! George Miller's will, dated September 1835 and recorded in the April 1836 court minutes, named his granddaughter Christiana Barrier. The division of personal property in January 1837 named these additional heirs: Emilia Miller; Jacob Miller; the widow; Sally Pitts, wife of Moses; July Faggart, wife of Reuben; Elizabeth Melchor, wife of Christopher Melchor; Leah Barrier, wife of John; Paul Miller; and Teeny Miller. The list of heirs named in the July 1837 division of real estate was similar, but it omitted the widow and added one name, Catherine P. Barrier, daughter of Esther C. Barrier, deceased. the Petition for Dower Lands by the widow Regina Miller, found in George Miller's estate papers, also gave the same list of children and heirs. George and Regina Plyler Miller and some of their children were buried in a family cemetery near Mount Pleasant; in 1975, their tombstones were moved to St. John's Lutheran Church Cemetery. 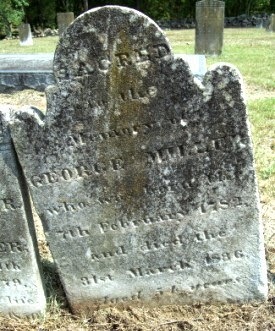 A closer look at Cabarrus estate papers, however, reveals the estate papers of another George Miller who died in 1836. This Petition for Dower Lands was filed by the widow Eleanor Miller and named the following heirs: George Miller; Tobias Miller; Frederick Miller; David Miller; Christian Furr and wife Susanna; Henry Beaver and wife Melia; and Green Redwine and wife Anna. The burial sites of George and Mary Eleanor (Phipps or Phelps) Miller are unknown, possibly lost. Son, Tobias Miller, and other members of the Miller family are buried at St. Stephens Lutheran Church Cemetery in Gold Hill Township. If not for the surviving estate papers, George Miller himself may have been unknown and lost. Further connections to George and Eleanor Miller may be found at a Phipps family blog site: click here. 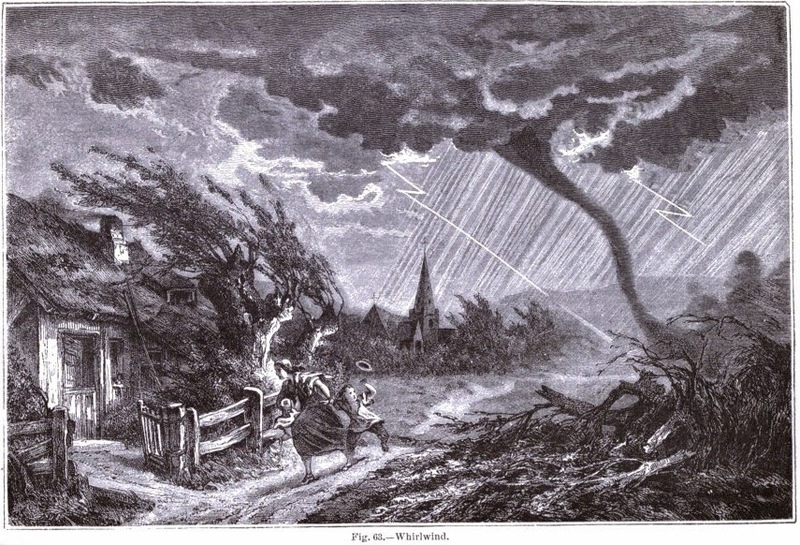 Trombes or whirlwinds ... "scattering terror and desolation in their paths..." In: The Atmosphere, 1873. From the work of Camille Flammarion. This time of year brings to mind the threat of tornadoes. Tornadoes are most common in the Central Plains and southeastern United States, and most North Carolina tornadoes occur in the southern portions of the Coastal Plain and Piedmont, including Cabarrus County. North Carolina tornadoes tend to move to the northeast along with their parent thunderstorm, but deviations and jumps are common. The typical tornado track in our state is a few hundred yards wide and a few miles long, although there is often a series of four or five tornadoes associated with a single thunderstorm, widening the path of destruction. The headline for the Concord Daily Tribune on Saturday, March 23, 1929 proclaimed "Several Hurt as Tornado Strikes County." On the previous day, Friday, March 22, a tornado had struck Cabarrus County, first touching down in Township 1, then heading northeast through Townships 11, 8, and 7. The storm brought torrential rains, marble-sized hailstones and great streaks of lightning. The area around Cold Springs Methodist Church suffered the most property damage. The church property sustained extensive damage with windows being broken, a hole torn in the roof and trees uprooted from the property. A number of injuries were reported. The family of T. A. Honeycutt, who occupied a two-story frame dwelling on the farm of Paul Stallings, had three of its members injured when the tornado twisted their home to the ground. One member suffered bruises on the head and shoulders while Mr. Honeycutt's wife suffered injury to her legs when she was trapped beneath the rubble of the house. The cabin belonging to Patsy Shankles was destroyed; she was picked up and thrown several yards. Fortunately, however, the injuries sustained by citizens of the county were not considered life threatening. Sadly, there was a death and others injured by the same storm elsewhere in the region. The livestock of the county were also affected. On the farm of R. A. Barringer, cows and mules were trapped under timbers in a demolished barn. Neighbors came to Mr. Barringer's aid and helped to free the trapped livestock. One cow had to be put down after suffering a broken leg. Ont the farm of J. F. Bost, chickens in a coop were blown away. The coop was later found eight hundred feet from its original resting place. This storm was dubbed the worst storm in the county's history with estimated damages of between $75,000 - $100,000. For more information about tornado preparedness, see the National Weather Service website: www.nws.noaa.gov . Illustration from Harper's Weekly, April 20, 1872. Courtesy North Carolina State Archives. Irish Potato Road, Irish Buffalo Creek - these names, and the upcoming St. Patrick's Day celebrations, bring to mind Cabarrus' Scotch-Irish heritage. 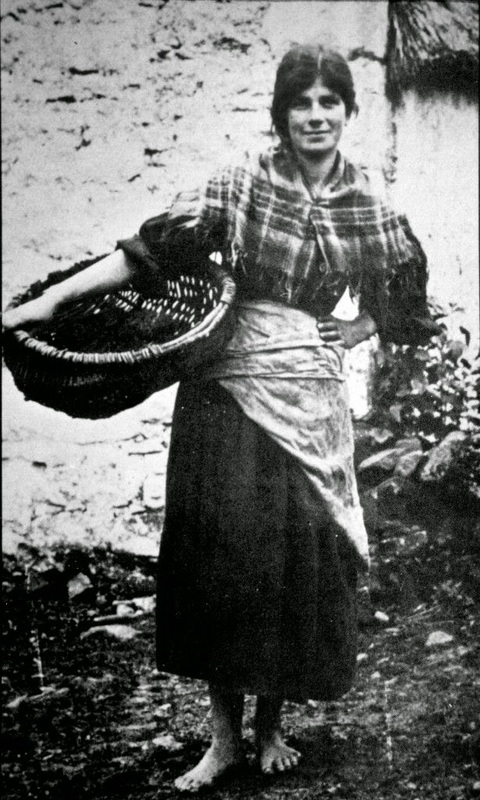 The Scotch-Irish were, in reality, Scotch Presbyterians who settled in Ireland. Due to religious persecution and the want of land and economic opportunities, mass emigration began in eighteenth century, largely between 1720 and 1774. 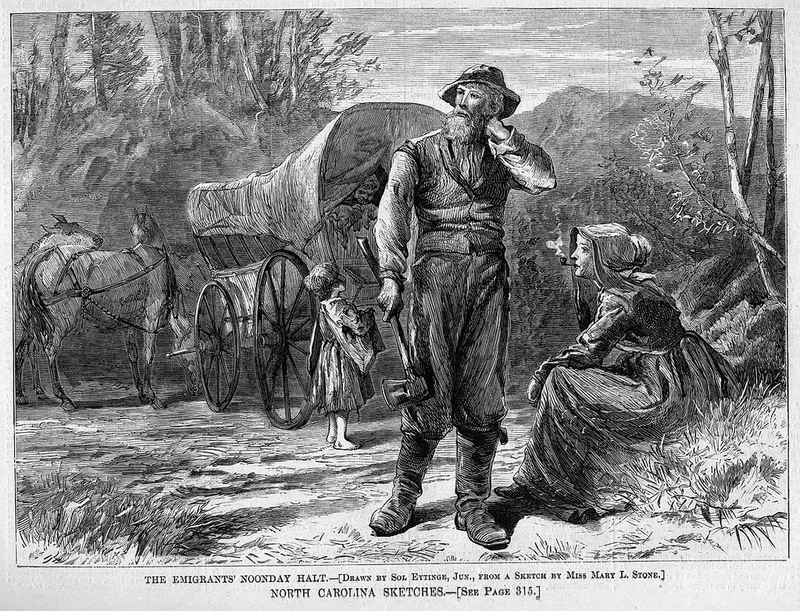 Many arrived in Pennsylvania and then spread south along the Great Wagon Road into the Carolinas and Cabarrus County, displacing the Catawba natives. The following is excerpted from an essay called "Customs of the Scotch-Irish in Cabarrus County." Published in 1935 by Margaret Virginia Ervin Smith, she describes the lives of these early pioneers. The essay is in the book Historical Papers on Cabarrus County, North Carolina by the Committee of North Carolina Colonial Dames, courtesy of Internet Archive (http://goo.gl/0848km). Early Scot-Irish and German Settlers House Type. "The pioneers came from the North in wagons in which they slept until they had built a house on land of their own selection. The house was built of hewn logs, the cracks stopped with clay, the roof covered with riven boards. One room, one door and one window, closed with a wooden shutter, was the characteristic style of architecture. The furniture of the house consisted of beds, a few stools, a table on which were set pewter dippers and plates, and wooden trenches. A few plow irons and harrow teeth, a hoe and mattock and an axe, a broad-axe, wedges, mauls and a chisel would be the inventory of the tools on the farm. Cattle, sheep, and geese, horses and hogs, were raised with great profit and from the wool the clothes of the family were spun. When the family began to put in a glass window and to buy cups and saucers of china ware, they were considered wealthy. They did have their wealth in their own capacity to manufacture what they needed when the goods brought with them began to wear out . . . the people were an industrial as well as an industrious people. They were producers. Nearly all the farms of any size had a distillery attached and a good deal of the corn was marketed in liquid form. One of the faults of the Scotch settlers was drunkenness, though the majority were temperate drinkers. . . Whiskey played a great part on funeral occasions, and especially at "vendues" [public auction] where it was supposed to put the buyers in a good humor. The tavern on the public road was a famous institution of these early days. . .
of Stanton Co., VA NewsLeader. Among amusements of the people were horse racing and shooting matches and the game of long bullets, played with an iron ball, the effort of each side being, as in football, to keep the ball from passing the adversary's goal. But while gambling was permitted and drunkenness condoned, profane swearing was punished severely, the amount of the fine sometimes depending on the vigor and variety of the oaths used. The children received six months schooling and the number of college bred men was large. The war-like instincts of the people were kept alive by the military muster, which became the occasion for a gathering together of a county to a county seat. They were noted for their skill with the rifle, and rifle manufacturing. A specimen, with its long barrel and wooden stock extending to the end of the barrel having been presented to Gen. Washington and being highly prized by him. Life centered around the church. The foundations of Sugar Creek, Hopewell, Steel Creek, New Providence, Poplar Tent, Rocky River, Centre and Thyatira were laid almost simultaneously. . . In a letter from Gov. Dobbs to the board dated Aug. 24th 1755 found in The Colonial and State Records of North Carolina, we have proof that the Scotch-Irish were a very prolific people. Quote: 'There are at present 75 families on my lands. I viewed betwixt 30 and 40 of them and except two there was not less than from five or six to ten children in each family, each going barefoot in their shirts in the warm weather, no woman wearing more than a skirt and one thin petticoat.'" "All, both men and women, wore wool hats with an exceedingly narrow brim. A few, however, of the highest rank had them made of beaver, which would last a lifetime. The young people of both sexes, in summer, when about their ordinary business, went without shoes and stockings; the young women wore short gowns and petticoats, and the young men, hunting shirts, with trousers of tow and cotton. Boots were not common; they were worn only by a few of the highest rank. Both boots and shoes were sharp pointed at the toes . . .Living at great distances apart, most people were compelled to travel many a weary mile to the house of God and return the same day. To go ten or twelve miles was accounted little hardship; even if, women and all, they were required to walk. The young ladies carried, wrapped up in a pocket handkerchief, their fine shoes and stockings, together with their linen aprons . . . When they came near the place of worship, they sat down on a log and put these on: and on their return, replaced them as before . . . carefully preserved to be opened again the next Sabbath. They ate their meat upon wooden trenchers and drank their milk from little noggins. Coffee was little used." So, back to Irish Buffalo Creek, which runs from Rowan County, south into Cabarrus. A number of Scotch-Irish families settled along this waterway and gave it a name that identified their community. The German settlers did the same with Dutch Buffalo Creek. So, why is "Buffalo" part of the name? Well, as it turns out, bison formerly existed in the western half of North Carolina and into the central Piedmont, especially in Cabarrus, Stanly, and Mecklenburg Counties. Unlike the Great Plains bison who graze in large herds, the eastern bison lived in small scattered herds. The creek names suggest they were around when the area was first settled. 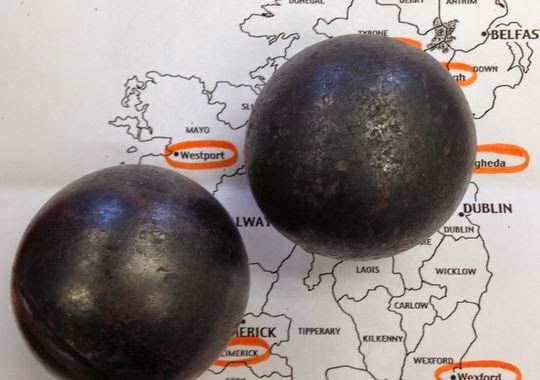 They disappeared from the state by 1765. As you celebrate this St. Patrick's Day, raise a noggin to the Cabarrus County's Scotch-Irish pioneers. May your blessings outnumber the shamrocks you grow, and may trouble avoid you wherever you go! March is Women's History Month. Here we remember Sophia House Ludwig, a woman who was a Cabarrus County pioneer and the daughter of a Revolutionary War soldier. The following text is taken from a memorial script by R. A. Goodman written in 1921, courtesy of the Eastern Cabarrus Historical Society and Museum. Augusta "Gus" and Lilly, date unknown. When Mrs. Sophia Ludwig, of Mount Pleasant, passed to rest on the 29th of January , at the advanced age of 97 years, 4 months, and 14 days, Mount Pleasant, and perhaps Cabarrus, lost a woman greatly beloved and respected by the community and in many ways, besides her great age, remarkable and interesting. She was born on the 15th of September, 1823, the third daughter of Jacob House, a veteran of the Revolutionary War, and his wife, Sarah Barringer House. All of her several brothers and sisters have passed away with the exception of the youngest of them all, Mrs. Kate Litaker of No. 11 township of this county. Mrs. Litaker recently celebrated her 85th birthday. Her children are well known in this county. She was the mother of five sons: Prof. H. T. Ludwig, Ph. D., for many years professor of mathematics in North Carolina College and ranked high in the state and nation as a mathematician, scientist, and historian; J. H. Ludwig, deceased; Press. 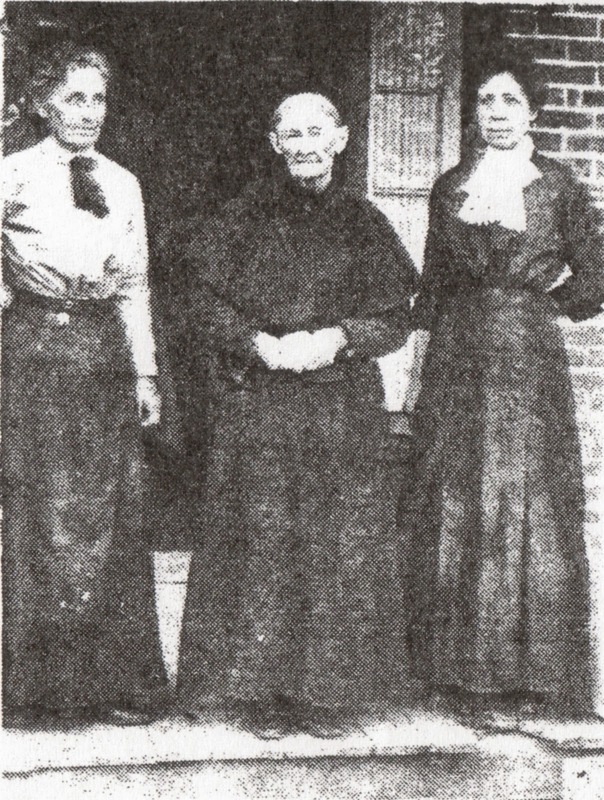 A. Ludwig, of Marietta, Ga., for thirty years a teacher in the public schools of North Carolina, Texas and Georgia; and Prof. S. J. Ludwig, of the Efird Public School, Albemarle; and three daughters: Mrs. Louise Ramsey, and Misses Augusta and Lillie Ludwig, all of Mount Pleasant. Her daughters have been her constant attendants and gave the best of their lives to their mother in tender care and love. Mother Ludwig, as she was lovingly known far and near, was a woman possessed of a beautifully simple and sublime Christian faith. She knew in whom she trusted and could give a satisfactory answer to any who might ask. Since before 1870 she has been a member of Holy Trinity Lutheran Church, Mount Pleasant, and discharged her vows faithfully until the end, when she fell peacefully asleep comforting herself with the famous Gospel passages of Holy Scripture and singing the glad song of redemption. At the age of 15 years, under the blessed ministry of the Rev. Henry Graeber, a pioneer Lutheran minister, she was confirmed in St. John's Lutheran Church, in the building that was known as the Red Church. There were 40 in her class, and a few days before her death she recalled with keen interest the events of the day. She remembered that all the girls wore white dresses and lace caps and that when a procession had been formed in the school house near the church, with the pastor and officers of the church in the lead, they advanced to the church for the solemn service of the House of God. For 82 years she remained constant in her faith, a long life dedicated to the glory of God. Mrs. Ludwig's life was one of regular habits. She had a time to sleep, a time to wake, a time to eat, and a time to work. She arose early in the morning, and in her last years, while her eyesight was still good, she was accustomed to read a portion from the Bible, a psalm or two, or one of her favorite hymns, and when the morning mail came, read the daily paper. She was a regular reader of the Daily Tribune. Her great age never dimmed her interest in current events, and while her remarkable memory reached back over the best part of a century and covered most of the interesting developments of the United States of America, she was familiar with the events of the Great War [WWI] and the incidents of the present. She went to the polls and voted at the last election, and was very much interest in the franchise [suffrage] that had come to her in her old age, to her who had seen many presidents come and go. Born in Cabarrus, about on mile above the town of Mount Pleasant, she spent her whole life within the bounds of the county. Seventy-two years ago she came with her husband to live in the village of Mount Pleasant. All that could be called the village consisted of one little white store kept by Dan Walker and two other homes besides her own. One of the homes was built and occupied by Mr. Walker and the other some years later came into the possession of Matthew Cook, now occupied by Mrs. Jesse Shuping. 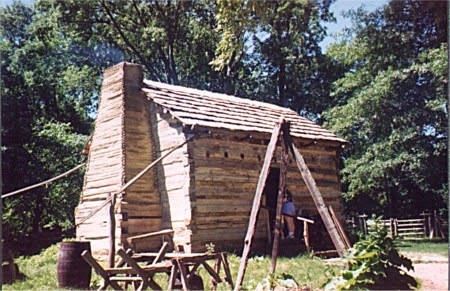 Mrs. Ludwig's own home was a small log house which stood on the property now owned by the family and just in front of the present residence. Here from this little home she saw much of life and remembered much of the happenings of the years. War reminiscences fell from her lips with great ease and interest. She was in the habit of recalling the year of her birth by associating it with the death of Napoleon, who died two years before she was born. She distinctly remembered several uprisings of the Indians, one of which was that of the Catawbas, who lived across the Catawba River in which is now Catawba County. Her uncle, George Barringer, collected a body of men and went against them. None of the expedition ever returned and it is supposed that they perished in an attack on the Indians or in an ambush by the savages. A relative of her husband, George Ludwig, volunteered and fought in the Black Hawk War. She saw relatives and friends march off to the Mexican War, and when the War between the States came on she gave two of her own sons to the defense of the South. The Spanish American War and the Great War complete the list of wars through which she lived, five wars in all. Persons, events and incidents could be recalled by her with great clearness and interest up till the last days of her life. She passed away amid the general regrets of the community. Her last hours was solaced by the presence of all her living children. She was laid to rest in the cemetery of St. John's with her long departed husband lying on her right hand and her learned and honored son, Dr. Ludwig, on her left. The service was conducted by her pastor, Rev. R. A. Goodman, and in spite of the very inclement weather was attended by a goodly number of relatives and friends.